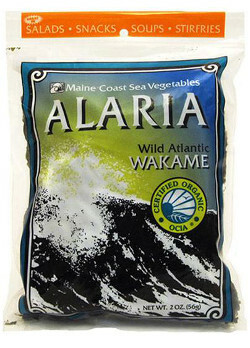 Maine Coast Sea Vegetables Alaria Whole Leaf 2 oz. Alaria is a preferred sea vegetable for miso soup. Its mild flavor profile allows it to blend in with many other ingredients without overwhelming them. Whole Leaf Alaria can be marinated, blanched or steamed for use in salads, or quick roasted and enjoyed as "chips." Maine Coast Sea Vegetables is committed to the rediscovery of this ancient food source from the sea. Their mission is twofold: to provide high-quality North Atlantic sea vegetables as user-friendly foods and to build long-term relationships with their suppliers and the environment.